• Operate without Obstruction: A unique, compact design improves driver visibility by more than 20% compared to competing devices. • The Perfect Upgrade: Compatible with Intermec CV30 mounts, scanners, keyboards and accessories— preserving legacy investments. 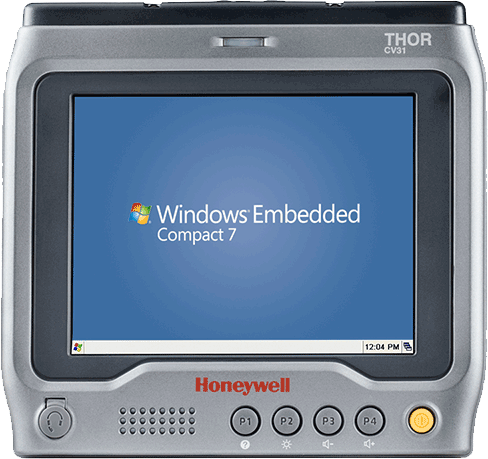 • Powerful Components: Microsoft® Windows® Embedded Compact 7 operating system takes full advantage of the CV31’s OMAP4 1.5 GHz dual-core CPU and 1GB RAM. • Cold Storage Capable: Optional touchscreen defroster extends application to cold storage operations. • Smart Power Management: Optional integrated 9-36 VDC power converter and ignition control eliminates the maintenance expense and lost productivity caused by a dead vehicle battery. • Vocollect TouchConnect: A simple touch is all that is needed to pair Vocollect SRX2 headsets to the CV31.